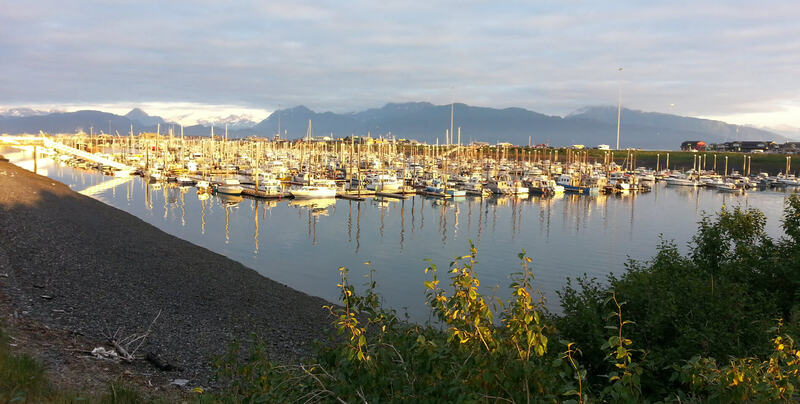 It’s that time of year again: the spring migration north for me (Tim) from Minnesota – where I live and work during the off-season, to Alaska, where I team up with my wife Maria and work Majestic View Bed and Breakfast in Homer, Alaska. My trip started out in central MN, when my son and I took off early on a Monday morning – drove across North Dakota, Montana, and up through Alberta, Banff, Jasper, and on over to Fraser Lake, BC, Canada – where my brother and his family live. That was 30 hours of driving in all. We stopped for a visit, did some hiking in the mountains, looked for a black bear for my brothers freezer (they like bear meat, but the bears were still sleeping), looked for moose and deer antler sheds, played frisbee, cribbage, and generally ate too much. On Friday afternoon, we packed up and drove the next 35 hours non-stop through northern BC, the Yukon, up to Tok, Alaska, and down the west side of the mountain range to Anchorage. Meanwhile, my lovely wife Maria was flying over our heads headed for Anchorage as well. She had been visiting her parents in Florida, and taking part in her annual Zumba Cruise Ship event. The trip couldn’t have gone much better for Ben and I. We had great conversations about life and women and spiritual things, politics, and minimalistic living; in the next breath, we were singing along to playlists of The Eagles, Boston, and doing our best to impersonate James Hetfield of Metallica – which jamming to helped us to stay awake during sleepy times. Too much Shakey Graves got to me at times. We also enjoyed looking for wildlife – which was the best in Northern BC coming up Highway 37. We saw at least 15 black bears, several moose, a couple caribou, foxes and coyotes, rabbits and squirrels, eagles, and a myriad of waterfowl. One particular mountain in the Yukon was loaded with the white sheep – around a hundred by our count, but without a good spotting scope, we couldn’t tell if there were any big rams – which I am most interested in. Ok Maria – there’s a great gift idea for you as my birthday is coming up! We found that the trip goes SO MUCH MORE SMOOTHLY when there is not a trailer or boat behind the truck. We used half as much gas, and could hit giant ice heaves in the road much quicker without banging our heads on the roof. This trimmed 7 total hours from the last time I came up pulling a boat (that took 72 hours). Our timing was amazing, and we met up with Maria in Anchorage after she had just finished getting a car-load of supplies for the upcoming B and B season. We traveled together from Anchorage to Homer, dodging moose on “moose alley” between Soldotna and Homer. When you travel to visit Majestic View Bed and Breakfast, keep a close eye on this stretch – especially around dusk and after dark. Everyone wants to see moose. No-one wants to hit one. So here we are, and there is work everywhere we look. Maria and Victoria are busy cleaning and preparing the house – every nook and cranny. There are repairs and upgrades to do. The grounds need help. Lots of clean-up from a winter of doggy doo-doo. Painting and staining and caulking. Oh yeah – I gotta get the boat ready, my gear, ATV’s, trailer, two trucks, and so on. We will all plug away a little each day, and it will get done. Since I need variety, and being a therapist- I am very much into self-care – I will also be taking time to have fun. That means getting out and finding where the critters and fish are – so that I am prepared to give the best tours when our guests arrive. Now that I am here, I plan to make blogging part of my daily routine. It is good communication and information, which people seem to enjoy, and also helps with our SEO. I will leave you with a video my son Ben took last night around 8pm when we were returning from a short, very wet and muddy ATV ride at the head of the bay. Moose have been eating “CRAP” – essentially browse, bark and twigs for the vast majority of the winter, because what they prefer is unavailable or otherwise too buried in the snow. This is interesting moose behavior. Mother moose has taught her two yearling calves how to save energy and maximize food intake when the short, tender green grass first becomes available. Check it out – and watch for regular blogs featuring the going’s on at our Homer Bed and Breakfast.